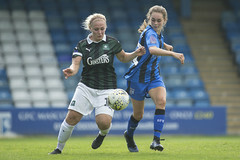 Gillingham FC Ladies matched their best ever result against opponents Chesham United Ladies on a cold Sunday afternoon at Priestfield with a dominant 5-0 win that saw Sammy Booker register a hat-trick. 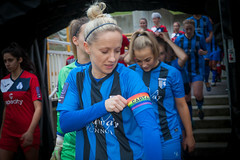 Gillingham Ladies FC’s last meeting with Chesham United Ladies was early on in the 2013/14 season, when the Gills routed Chesham 5-0, in the season which saw them record their best ever league finish. The Gills started brightly against Chesham, with a couple of chances coming close to breaking the deadlock in the first 15 minutes. However, in the 15th minute the Gills were taken by surprise as a corner was cleared out by the Chesham defence, leading to a Chesham counter attack that went wide of the Gills goal. Another chance followed this, in a similar vein to the counter that caught the Gills by surprise in the 15th. A foul on Millie Waud saw Gillingham conduct some good build-up play, but unfortunately it came to nothing. Despite this, the Gills were firmly in the driver’s seat, bringing the game to Chesham. The first goal of the game came in the 21st minute, with Sammy Booker bundling the ball into the back of the net, following a Gillingham corner that Chesham simply couldn’t get rid of. Gillingham looked far more comfortable with this one goal cushion, and were troubling the Chesham back line frequently, forcing Chesham into multiple clearances from runs by the Gills attacking threats. Chesham nearly pulled themselves back into the game in the 25th minute following a great counterattack, but were denied by a stunning Shanly save. 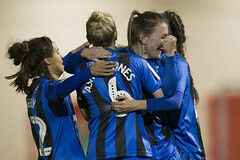 A breathless five minutes followed at Priestfield, with Ellie Manning converting from the penalty spot in the 29th after Mollie Kmita was brought down in the box. A third then followed two minutes later, after a shot from Breon Grant rebounded and was put away by Booker to get her second of the game. Gillingham had a couple more chances after this, but none made it in, sending the Gills into half-time 3-0 up. After the second half kicked off, the two sides looked evenly matched, with both goalkeepers being called upon to make some saves early in the half. In the 65th minute, however, the Gills extended their lead to four with an impressive lob from Breon Grant to beat the Chesham goalkeeper from short-range, which was met with great cheers from the Gills faithful. Breon Grant was taken off by gaffer Jack Wheeler in the 71st minute, with Niamh Jestin taking her place. Around five minutes after this, Chesham came agonisingly close to bringing one back with a powerful shot from the edge of the box that beat Shanly and rattled the Gills crossbar, and seemingly the Gills side a little. 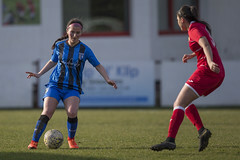 However, the Gills were not on the back foot for too long, as just one minute later, Sammy Booker finished her hat trick with a great strike to put the Gills 5 goals ahead of Chesham with 12 minutes left to play. Emily Symonds, who had a great game, was replaced with six minutes of normal time left by Sharna Giordani, leaving the pitch to a chorus of applause. Chesham were not going to admit themselves to defeat though, and Shanly was called on in the closing minutes to make a brilliant diving save, followed by a calm aerial collection from the subsequent corner. 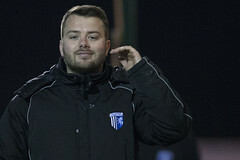 The match calmed down after this, and the referee’s whistle was met with cheers from the Gills bench and fans, as Gillingham advanced to the next round of the WNL Plate with a dominant performance from start to finish.